Brit Marling is “intoxicating” (The Huffington Post) and “stirring” (PEOPLE) in the year’s most talked-about psychological thriller. A filmmaker (Christopher Denham) and his girlfriend (Nicole Vicius) set out to expose the beautiful leader of a cult (Marling), who claims to be from the future. But the more they explore, the more danger they face in this “intricate and taut thriller” (Claudia Puig, USA Today) from writer-actress Marling and writer-director Zal Batmanglij. I have to say I had a hard time getting into this movie. 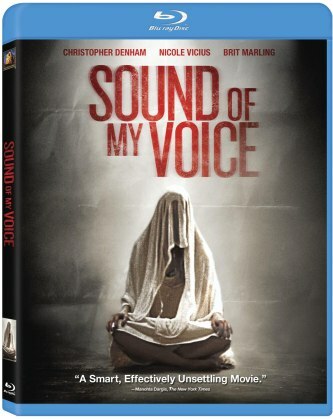 Sound of My Voice is about a couple trying to expose and uncover the truth about Maggie, the leader of a cult who says she's from the future. It's one of those movies with the story line that you either love it or hate it and I surprisingly, I found myself in between. I'm usually okay with indie/short budget films and enjoy them for the most part, this was one that didn't make my list of favs like I hoped it would, but it wasn't horrible, just something you'd have to prefer. There are so many different things about this movie that had me headed in the middle instead of one direction of loving it or hating it. What brought me to not disliking it entirely was how they wrapped up the ending. If you have a movie that can make you think and make you doubt what you thought from the beginning then I think the writer got his point across. Disclosure: All opinions are my own. I received Sound of My Voice at no cost for the purpose of this review. No other compensation was received.